We all know that telescopes are some of the most advanced and intricate pieces of technology in the modern age. But have you considered a telescope that you can control…from an app on your smartphone? Celestron continues to amaze us with new and innovative products, this time with the COSMOS 90 GT. You’ll be able to differentiate the 90 GT from other, powerful Celestron products by its longer, tubular body. You’ll also notice that there is no place to properly grip the telescope. The 90 GT is a completely hands-free telescope, except for the controls you make on the smartphone/tablet app. Unlike most telescopes, this one is perhaps the best to be controlled within the vicinity of your home, assuming you have WiFi close by. The COSMOS Celestron Navigator app is free to download for iPhone, iPad, and Android smart devices. This telescope seems like it’s a product of the next generation and more in tune with the larger, more advanced telescopes used by research institutions. Why bother fiddling with your hands when an app, database, and controls are all on your smart device? A drawback to this telescope is that it can only be controlled through a WiFi connection to its associated apps. If you’re out in the wilderness hoping to use this telescope, the only solution would be to use your smart device as a mobile hotspot. Regardless, the 90 GT is a preferred stay-at-home telescope. One aspect of the 90 GT that can be difficult to adapt to is the stabilization of the tripod. Many users have reported problems with their view because the tripod’s legs are always displaced and at different levels. You will find the process of using this telescope harder than usual if you live near inconsistent terrain. Even streets can be uneven with cement being bumpy and rough. You may have to innovate to get the tripod on solid and sturdy ground. This shouldn’t be too much of a problem if you have a mobile, flat surface for the tripod to stand on. A side walk will also make a good substitute. Like most Celestron products, the 90 GT comes with at StarPointer finderscope, always a handy addition for anyone who has trouble tracking objects with just their hands. The COSMOS Navigator App that controls the telescope will be immensely useful in finding stars and identifying constellations. The 90 GT is perhaps the best in its class at generating fine views of planets. While planets do not produce nearly as much light as stars, the 90 GT makes up for this by employing a 90mm refracting lens. It also comes equipped with two differing size eyepieces (20mm and 10mm) for different magnifications, depending on how far you want to look up into the sky. The 90 GT is a fantastic and outrageously advanced telescoped to be able to be controlled by your smartphone. 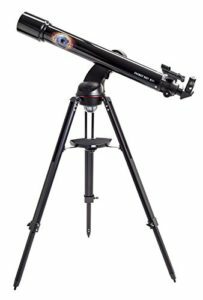 The telescope will automatically adjust to the commands given to it and with the correct placement of the legs, give you quality viewing. While some may find its requirement of WiFi to be problematic, the 90 GT will compensate you by giving you some of the best views of the planets in our solar system. Perhaps you’re interested to see what the long fabled rings of Jupiter look like? The COSMOS 90 GT can help you with that.